Smartphones using Bluetooth are taking over where locks and keys used to rule. Smartphones are quickly becoming our new keys. With them we can now open gates, front doors and alert our house that we have arrived home. 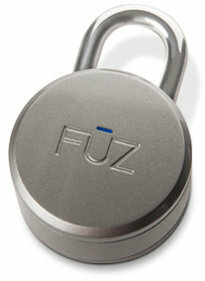 FUZ Designs has created the next Bluetooth proximity device...a keyless padlock. Although it can be used to lock anything, FUZ designed it knowing that many people would use it as a bike lock. It's got some pretty nice features. While the Noke looks very similar to a standard dial padlock (without the dial), it has a whole bunch of extra features. Probably the best feature is that you don't have to spin a number dial to open it. Once it's paired to your smarthphone, you simply have to press the shackle and it opens automatically. When the shackle is pressed, the Noke wakes up and searches for your smarthphone (or another smartphone that you've permitted to open the lock) within a 10 foot radius. If found, the lock opens immediately. You don't need to pull your phone out of your pocket or purse to make this work. If you or your phone is going to be within the 10 foot radius of the lock and you don't want it to open automatically, you can turn off the auto-unlock feature. When auto-unlock is off, you can open the lock through the phone app or by using the Quick-Click code. The Quick-Click code is a unique idea. Basically, it's a preset code that allows you to open the lock if your phone is dead or not with you. The Quick-Click code is actually akin to Morse code. By pressing or tapping the lock shackle in short or long bursts (just like you would with a telegraph key) you can enter the code. The lock works with a phone app that offers some nice features. If you need to give somebody else access to the lock, you can set them up with permanent access or one-time access. The app will also alert you when the lock has been opened and by whom, including a history log if you want to use the lock in a scenario where multiple people have access to it. Because FUZ expects that many folks will use this lock on bicycles, they have created a special cable and lock mount that connects to the seat post or bike tube. The Noke is currently available via their Kickstarter page for $59, which is $30 off the expected retail price.